Roll out the Jubilee Roller Banner Pens during the Queen's 60 yar celebrations for the best Company brand-name exposure you can think of. Queen Elizabeth II's 60 year celebration Diamond Jubilee - marks the 60 years of her reign at the throne. Excellent as a product with it's roller banner function, you can customise the artwork perfectly - just how you like it. Customers will gain good retention of your brandname, logo and artwork. You can add not only artwork, but perhaps a special discount of Company offer with the Jubilee Roller Banner Pen. Likely to be kept as a momento for this historical event. 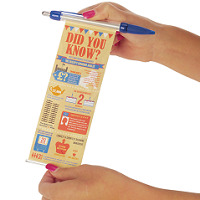 For a FREE QUOTE, please fill in the form regarding our Jubilee Roller Banner Pen and we'll be able to help you. Why not have a look at our other Diamond Jubilee gifts?